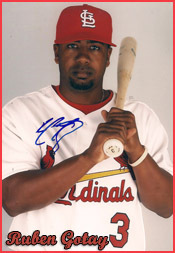 In 2010, Ruben Gotay was considered a promising candidate to earn an Opening Day roster spot with the Cardinals during spring training. Three years later, Gotay quietly slipped back into Cardinals spring training camp, this time as a surprise fill-in at the minor-league level. On March 27, 2013, during the last week of spring training camp at Jupiter, Fla., Gotay signed with the Cardinals and reported to Springfield to become the starting third baseman for the Class AA Texas League club. The signing was a stunner because Gotay, 30, hadn’t received interest from any major-league organization after spending the 2012 season in the minor-league systems of the Blue Jays and Braves. Five years removed from his last big-league appearance with the 2008 Braves, Gotay was home in Puerto Rico, trying to land a spot with an independent league team, when the Cardinals called. According to Kary Booher of the Springfield News-Leader, Gotay will be Springfield’s oldest player since infielder Aaron Miles, 34, was on the club in May 2010. Gotay and shortstop Jake Lemmerman, 23, acquired in December 2012 from the Dodgers for Skip Schumaker, will form Springfield’s left side of the infield. The Cardinals suddenly were in need of a Class AA third baseman because the projected starter, Matt Cerda, 22, a former Cubs prospect acquired by St. Louis in December 2012 during the minor-league Rule 5 draft, left camp, saying he may pursue a different career. The Cardinals weren’t ready to put a top third base prospect, such as Patrick Wisdom, at Class AA, so they went looking for a veteran. Three years ago, after signing a free-agent contract with the Cardinals, Gotay was considered a versatile talent who could fill a key utility role for St. Louis. He had played four seasons in the big leagues with the Royals (2004-05), Mets (2007) and Braves (2008) before spending 2009 in the minor leagues. Gotay was one of four non-roster infielders invited to the 2010 Cardinals’ major-league spring training camp. The others: Daniel Descalso, Pete Kozma and Donovan Solano. In 2010, Gotay was the best-known player in that group. As the starting second baseman for the Royals in 2005, Gotay had a 3-for-3 game against the Cardinals’ Matt Morris on May 21 Boxscore and followed that the next day with a home run off the Cardinals’ Jeff Suppan. Boxscore He has a .500 (6-for-12) career batting mark versus St. Louis. His uncle, Julio Gotay, had been the Cardinals’ starting shortstop in 1962. So having Ruben Gotay with the Cardinals appeared a natural. Gotay’s chance at earning a spot with the 2010 Cardinals was set back when St. Louis signed veteran infielder Felipe Lopez as a free agent during spring training. With two weeks left in camp, the Cardinals reassigned Gotay to Class AAA Memphis. Five months later, August 2010, Cardinals third baseman David Freese suffered a season-ending ankle injury. Gotay was batting .271 with a .400 on-base percentage as Memphis. But the Cardinals traded for fading veteran Pedro Feliz of the Astros rather than call up Gotay. Gotay finished the 2010 season with 135 hits in 139 games for Memphis. He had 30 doubles, 13 home runs, 70 RBI, 95 walks, a .285 batting average and a .410 on-base percentage. He made 17 errors at third base. Gotay was granted free agency after the season and signed with the Marlins organization. Now, in the unlikeliest of returns, he’s back in the Cardinals system.